The account of two Immigration and Naturalization Service officers who helped bring down a human trafficking operation that spanned the globe. When Acosta (The Shadow Catcher: A U.S. 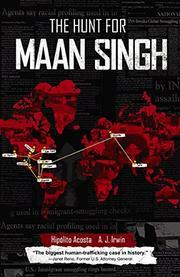 Agent Infiltrates Mexico's Deadly Crime Cartels, 2012) and his partner, Irwin, first became involved in the hunt for Maan Singh in the late 1990s, they had no idea what that operation would entail. In the beginning, the intent was to identify all businesses and individuals “from the point of origin all the way to the end” involved in human trafficking across the Mexican border. But it quickly became clear that the undercover operation would be dangerous not only because Maan Singh was “the “godfather of alien smuggling from South Asia,” but also because of federal bureaucracy. A lack of intelligence sharing across departmental lines meant that key information about investigative targets was not always available to the agents risking their lives on the operation. Acosta and Irwin realized that to capture Maan Singh and his cronies, they would have to pose as smugglers and appear to engage in human trafficking activities. The pair fought—and won—against obstructionism from the Department of Justice while battling the back-stabbing behavior and incompetence of their own colleagues. An operation initially limited to the Mexican border soon evolved into one that took Acosta and Irwin to Ecuador, Guatemala, Panama, and the Bahamas, where they mingled with smugglers and corrupt government officials as well as hit men hired to take them out. While the story does not lack for excitement, the authors’ attempts to transform their experiences into a kind of true-crime novella meet with limited success. The “characters” are not always well-delineated, nor is the sequencing of events and information effective. Furthermore, the writing is merely serviceable. Still, the complex web of international politics and intrigue may be of interest to those with a penchant for stories about the shadowy underworld of human trafficking. Certainly flawed but moderately informative and entertaining.